Sükhbaatar (Mongolian: Сүхбаатар‎) is ane o the 21 aimags o Mongolie, locatit in the east o the kintra. Its caipital is Baruun-Urt. It is namit efter Damdin Sükhbaatar. The Baruun-Urt Airport (UUN/ZMBU) haes ane unpavit runwey an is servit bi regular flichts tae Ulan Bator. 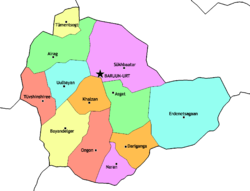 The Aimag caipital Baruun-Urt is geographically locatit athin the Sühbaatar sum, but admeenistrated independently. This page wis last eeditit on 17 Mey 2018, at 19:18.